The next day Obama made a gratuitous trip to New York city to visit Ground Zero, lay a wreath, meet fireman, police officers and a select group of only 50 of the 9/11 families. This was campaigning for 2012, cloaked in Presidential Kabuki theater and paraded as closure for the nation. No “spiking the football” here. 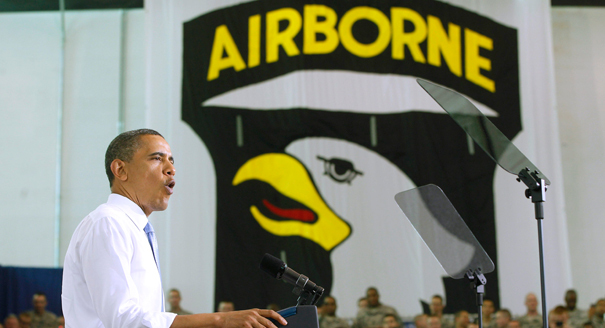 Today, under the guise of thanking the Navy Seals and aviators for the bin Laden kill mission, Obama with Joe Biden travelled to Fort Campbell Kentucky of the 101st Airborne and the 160th Special Operations Aviation Regiment (SOAR). This was another vain and shallow attempt to capitalize on the nation’s euphoria and continue Obama’s self-centered puffery of “I gave the orders”. Not only was Obama spiking the football, he was dancing in the end zone. On January 22, 2009 President Obama signed an executive order requiring the CIA to use only the 19 interrogation methods outlined in the United States Army Field Manual. This put an end to the “enhanced interrogation” that got the information on Osama’s courier from Kahlid Sheikh Mohammad and Al-Shaykh Al-Libi. In August of 2009 Attorney General, Eric Holder released the findings of a 2004 internal report by the CIA’s inspector general on the agency’s detention and interrogation of terrorists. This report told the world and every terrorist in graphic detail, exactly how they would be interrogated. Eric Holder did not stop here, he appointed federal prosecutor John Durham as a special counsel to re-open cases against the CIA Interrogators for potential criminal prosecutions. This is a vendetta by Holder, who is a left-wing hack. Even though the location and take down of Osama bin Laden was facilitated through the intelligence gathered by those CIA interrogators, their potential indictment and prosecution continues today. Barack Obama is of the same mind set as Eric Holder. On Thursday, Debra Burlingame, the sister of pilot Charles Burlingame of the plane that was crashed into the Pentagon on 9/11, met President Obama. Obama said, “No I won’t.” Then he turned and walked away. Many are calling President Obama “gutsy” for his decision to green light the mission. Did he really have any other choice? If he did nothing and bin Laden got away, or the mission failed just like Jimmy Carter’s Iranian hostage rescue attempt in 1980 — then Obama’s presidency would be over. So he had nothing to loose and everything to gain from the brave work of the finest military in the world. Barack Obama was handed a winning playbook based on a decade of detailed investigative work by the CIA and the NSA, with a well planned mission by the military commanders. Obama will squeeze every ounce of the death of bin Laden for his electoral advantage. Just wait and see how he will use all this in campaign ads. I’ve had enough of this left-wing phony. Let’s stop him from dancing in the end zone on November 2012.